The Chestnut-shouldered Goshawks (Erythrotriorchis buergersi) - also known as Chestnut-mantled Goshawks or Bürger's Sparrowhawks - are rare raptors found only in New Guinea. This species is closely related to the Red Goshawk (Erythrotriorchis radiatus), which is one of the rarest Australian birds of prey, and one of the oldest raptors in North Australia. Less than ten Chestnut-shouldered Goshawks have ever been reported. Except for one specimen reported in Foya Mountains in northern Papua - all others were found in eastern New Guinea. 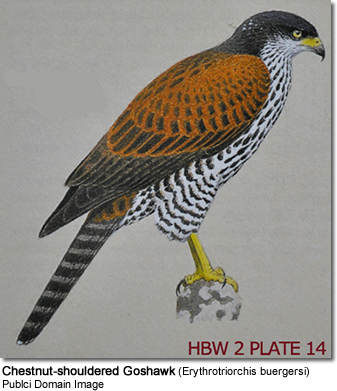 They inhabit hill and lower mountains, and occur at lower elevations than the Meyer's Goshawks (Accipiter meyerianus). They appear to remain at altitudes between 1,500 - 5,200 feet (~ 450 - 1,580 meters). Chestnut-shouldered Goshawks measure between 17 - 21 inches (43 - 53 cm), and average a weight of about 20 oz or 575 grams. The back is chestnut colored, turning darker on the wing. The head is dark slate. There are fine darkish streaks on the throat, chest and abdomen. The chest and abdomen are otherwise white. The thighs are described as rather than streaked. The tail is narrowly barred dark brown-brown. A melanistic form (dark phase) is known to exist. The cere (skin above the beak), legs and eyes are yellow. These raptors are believed to mostly prey on smaller birds and their eggs. They hunt by perching and making attack flights on their prey. It is likely that they also take small mammals (rodents) and reptiles.